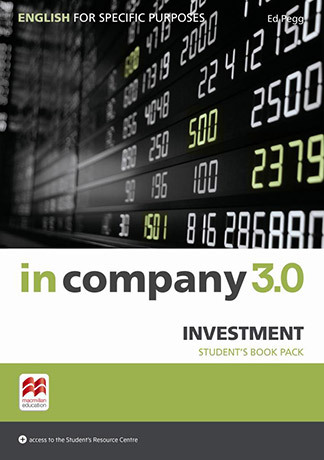 In Company 3.0 ESP Investment can be used by business professionals working in investment-related roles at different levels of seniority. The course uses the same communicative and people-skills focus as In Company 3.0, and can be used flexibly. It comes with a print Student's Book and access to an online Student's Resource Centre. Tailored, relevant content for a range of job specialisations. Short modules, with manageable units, ideal for short courses, for use with In Company 3.0 or other business courses. Extensive opportunities for personalisation, through discussion and framework activities. Checklists with demonstrable learning outcomes to measure learning at a glance. Authentic video content, providing interviews with real business professionals. Downloadable audio and video, which can be accessed at any time.